"Now do you understand why I hate boomers?" Any time a sequel to a popular series is released, there is a good chance it will not live up to the original. This is especially true if there were favorite elements from the original that are changed or handled in a different way in the sequel. For the original Bubblegum Crisis, the atmosphere and especially the music were major factors in that show's appeal. Bubblegum Crash, a three part OVA released two years after the Crisis prequel, AD Police, is a marked departure from the tone set in the original, however, I found that it presented its own style very well, if not quite up to par with its predecessor or the much later remake, Bubblegum Crisis: Tokyo 2040. A lot has changed in MegaTokyo in two years. For the Knight Sabers, things have been pretty quiet, and the team is in limbo. Linna (Michie Tomizawa) has taken on a new job in the stock market to great success; Priss (whose voice actor changed for this series to the chagrin of fans) has changed her singing style, and is on the brink of a major record contract; Nene (Akiko Hiramatsu) is still working at AD Police headquarters, but wants out of her job; Sylia (Yoshiko Sakakibara) has all but vanished. The future does not look good, as the members drift apart, which could signal the end of the Knight Sabers. The AD Police have their hands full when a group of mercenaries turned bank robbers, known as the Illegal Army, resurfaces. The thieves are wearing modified military body armor, and are impossible to beat, but there is more to their mission than first meets the eye. It soon becomes evident that they are also stealing parts necessary to complete a new AI that has been in secret development by a number of major companies. The Knight Sabers are contracted to find the perpetrators and put an end to the thefts before the AI components are fully in the wrong hands. Outfitted with newly revamped hardsuits, they should be ready for the challenge, but are their own inner conflicts too much to withstand the pressure? Bubblegum Crash can be regarded as an alternate universe for the series, since there are distinct differences in the technologies employed that don't fit a linear continuity. The main characters, including AD Police staff Leon and Daley, return and are featured more prominently, but also aren't identical to the original. In terms of style, Crash has more of a Hollywood action feel than the familiar cybernoir of Crisis. 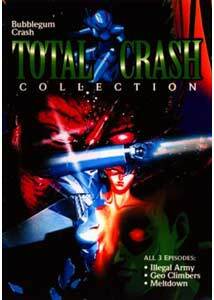 If you can go into this with an open mind and no preconceived ideas about it, it makes a decent addition to the Bubblegum Crisis collection, and is a must for completists. Image Transfer Review: Overall image quality is quite good. Colors are generally solid, though have a less saturated palatte than more modern shows, with reds tending to be subdued. Black levels are pretty good, but do hover in dark grey on ocassion. Aliasing isn't a problem, but there is some noticeable macroblocking in a couple of areas of the first episode. There is some stuttering in the original animation, and there is some brief interlace artifacting, but nothing major. Audio Transfer Review: Japanese and English dubs are available. The Japanese track occupies a fairly narrow soundstage most of the time, but does expand outward with some directionality from time to time. The English audio is noticeably louder, but suffers in the music numbers with thinner backing tracks. Extras Review: Primary extras are a pair of image galleries. The first contains 26 color frames with various design and promotional images. The second contains 49 screens of black & white concept drawings, covering the girls and their many outfits, auxiliary characters, locations and an assortment of mecha. I did experience an anomaly with the song subtitles, which ended up red and green striped on my principle player. End credits are available in either Japanese or English, which are on alternate angles depending on the language track selected. An ample 9 chapter stops per episode are available. A set of liner notes covering lyrics to the songs are provided as an insert, but for some reason the production credits and episode overviews available on AnimEigo's site were not included. Bubblegum Crash, collected here in its entirety, has its own merits, but must be approached without preconceived ideas for full enjoyment value. It does tend to go over familiar ground, especially if you've already seen the Tokyo series, but I still enjoyed it on its own terms. While probably the weakest of the Bubblegum series, it still manages to hold its own, and you can't go wrong with girls in hardsuits.